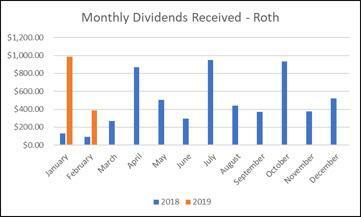 John's retirement accounts generated a total of $935.66 in dividend income for February 2019 vs. $430.26 of dividends in February of 2018. We took advantage of some high stock prices in February and exchanged them for shares of undervalued stocks. A total of two companies in John's retirement accounts paid increased dividends during the month of February. 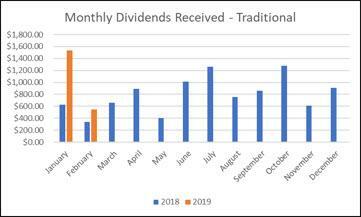 Traditional IRA dividends were 62.6% higher in 2019 than 2018. 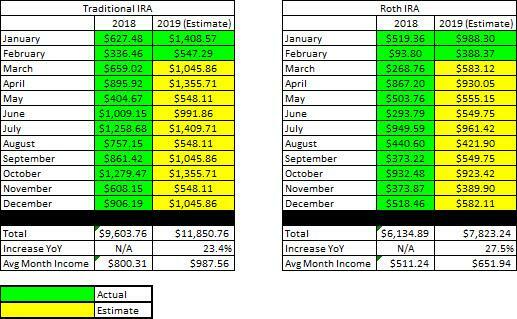 Roth IRA dividends were 314% higher in 2019 than 2018. This article was severely delayed because my fiance got me hooked on Game of Thrones (GOT) and I have made a concerted effort to watch all of the currently available seasons before the release of the 8th and final season. While this has taken away from my normal free time (and I mean literally all my free time), it has provided me with some interesting thoughts about the stock market. For those who have not seen GOT but plan to watch it at some point please understand that the remaining segment will include spoiler information about seasons 1-7! One of the reasons why I have enjoyed GOT so much is that the plot line does not follow a conventional movie or TV series. For instance, what series can you say has killed off (what we expect to be) two main characters, Robert Baratheon and Eddard Stark in the first season. As the show continues this theme of "no character is safe" I find myself at the edge of my seat completely blown away by the fact that even lovable characters like Shrine Baratheon are not spared (and in her case specifically) is subject to an extremely cruel death. On the other hand, we have seen despicable characters like Jamie Lannister go from being one of the most hated characters to an individual who grew a conscience and cares for others. On the other end of the spectrum, we see individuals like Stannis Baratheon end up consumed by their own power and quest for glory devolve to the point where he loses everything. No stock is immune to changes in the economy and the impact of various reports (unemployment, manufacturing, etc.) or unexpected events. Each company has the potential to go through phases of weakness or strength. I view this as particularly relevant in industries that are recession resistant as well as those that are subject to high levels of government regulation/oversight. While the current narrative may be true now, it is possible that an acquisition of another company or a sale may have a significant impact that changes the current value proposition. 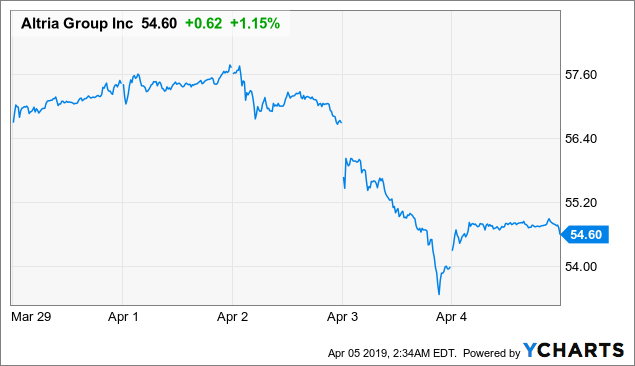 As most know, Boeing (BA) experienced a major drop in share price related to the grounding of its new 737 MAX planes. The drop of 15% in less than a month is pretty dramatic and presented investors with a complicated question to answer. Is the problem big enough that it could have a larger-than-expected impact on quarterly/annual earnings or is this simply short-term noise that is creating a temporary buying opportunity? The key is to remember that no stock is too strong to fail but is also equally capable of returning to its former glory. 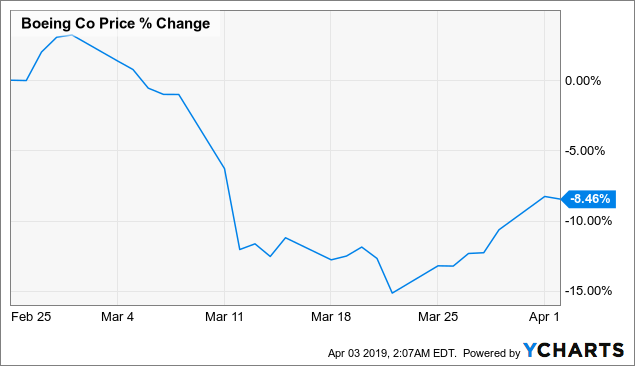 Altria (MO) is a favorite for dividend investors but is a constant target for the negative press which is supplied by the FDA which both is anti-smoking and vaping. A recent meeting with FDA Administration Commissioner Scott Gottlieb caused the stock to lose -2% of its value based on his dislike of the 35% acquisition of Juul and the continued practice of marketing the product in a way that appeals to teenager/young adults. Although these two companies aren't dividend growth stocks, Google (GOOG) (NASDAQ:GOOGL) and Amazon (AMZN) are two major companies that have the potential to break-up or spin-off any segment of the fast-growing businesses. If we set aside political beliefs, it is possible that these companies are becoming too vertically and horizontally integrated which will create difficulty in the event they try to grow (via acquisition). There is also real potential that certain segments of these companies would be best operated as their own entity. For instance, AMZN's Web Services being broken up from the retail/warehouse operations has the potential to unlock the real value of Web Services which generates a significant portion of AMZN's revenue. I expect to see a slow-down in attempted acquisitions for these two entities because I believe the government is going to put more effort into scrutinizing the potential impact of their proposed transactions. Both of these increases were already covered in the Taxable Account update John And Jane - February Taxable Account Update - Building Up Cash Just Makes Sense. I will not include my summary on them but I will include information about the dividend increase. EPR - The dividend was increased from $.36/share per month to $.375/share per month. This represents an increase of 4% and a new full-year payout of $4.50/share compared with the previous $4.32/share. This results in a current yield of 5.75% based on a share price of $78.32. Realty Income - O's dividend was increased from $.2210/share per month to $.2255/share per month. This represents an increase of 2% and a new full-year payout of $2.71/share compared with the previous $2.652/share. This results in a current yield of 3.78% based on a share price of $71.79. There are currently 24 different positions in John's Roth IRA and 33 different positions in his Traditional IRA. While this may seem like a lot, it is important to remember that many of these stocks are held in both accounts and/or are also held in the Taxable portfolio. Traditional IRA - The following stocks were added to the Traditional IRA during the month of February. STAG Industrial (STAG) - Bought 100 shares @ $27.63/share. Valero Energy (VLO) - Bought 15 shares @ $83.27/share. The following stocks were sold from the Traditional IRA during the month of February. Covanta Holdings (CVA) - Sold 100 shares @ $17.09/share. Pacific Gas & Electric Preferred Series D (PCG.PD) - Sold 200 shares @ $17.07/share. Boeing (BA) - Sold 20 shares @ $418.96/share. Lexington Realty (LXP) - Sold 700 shares @ $9.32/share. Roth IRA - The following stocks were added to the Roth IRA during the month of February. Valley National Bancorp (VLY) - Bought 150 shares @ $10.61/share. The following stocks were sold from the Roth IRA during the month of February. Caterpillar (CAT) - Sold 40 shares @ $138.89/share. 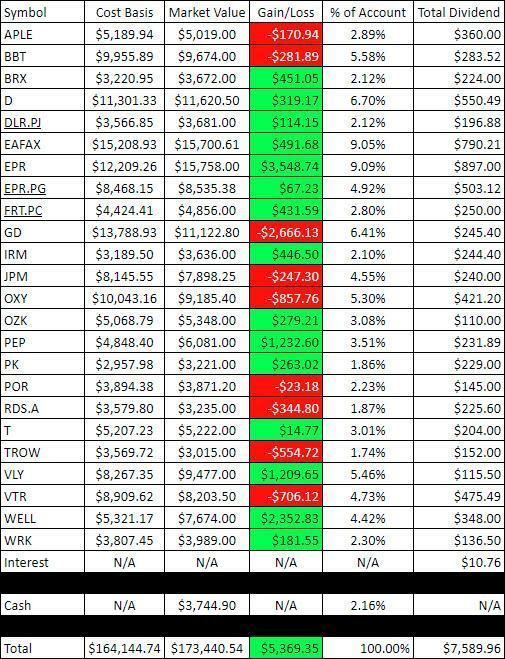 The Traditional IRA saw a significant amount of action during the month of February which was largely attributed to the sale of shares that I considered to be fully valued (Boeing, Lexington Realty, and Covanta) which was offset by what I consider to be the worst investment I have ever added to John's portfolio, Pacific Gas & Electric Preferred Series D. PCG.PD was added at the worst possible time (right before the second set of California wildfires) and was continued to be held with an optimistic mindset. Unfortunately, not only did this optimistic scenario never occur but the most pessimistic outlook seems to have taken hold now that California law places a significant amount of blame on Pacific Gas & Electric. Although February is one of the lighter months of the year, John was still able to generate more than double the amount of dividend income in his retirement accounts in 2019 as he was in 2018. It is still worth noting that some of this year-over-year change was the result of having not fully deployed all of John's funds in 2018 or that recent share purchases were passed the ex-dividend date. 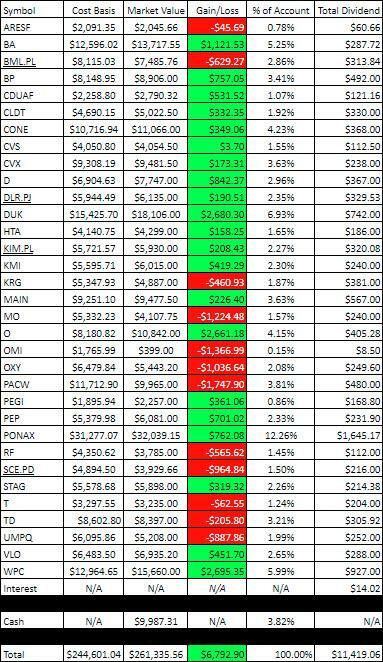 When it comes to the topic of transparency, I like to show readers the actual gain/loss associated with each position in the portfolio because it is important to consider that in order to become a proper dividend investor, it is necessary to learn how to live with volatility. It should be noted that the dividend total in the far right column of both the Traditional and Roth IRA isn't always accurate because these accounts are more regularly traded and I have been guilty of forgetting to update the dividend when additional shares are added/sold. The Gain/Loss is exact and represents prices from market close on April 5th. March saw trading activity that was higher than the normal activity for purchases which is why the cash reserves have dropped so much from the January update. John is currently sitting on almost double the capital gains in his retirement account when compared with the update from January. Lastly, I recently created a table to demonstrate how the account balances have changed on each of the retirement accounts. 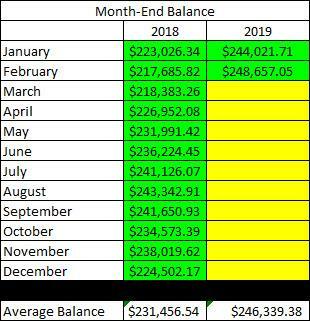 The Traditional IRA had a February month-end balance of $248,657.05. The Roth IRA had a February month-and balance of $169,261.33. John's portfolio continues to look solid and has experienced less volatility because we continue to focus on REITs and utilities. Although a number of trades were made during the month of February the gain was offset by the loss associated with the sale of Pacific Gas & Electric Preferred Series D. Personally, I am happy that we can eliminate these shares and redeploy the funds elsewhere because they have never actually provided any dividend income for John. As a side note to the Pacific Gas & Electric scenario, I will no longer invest in any California utilities because of their interpretation of inverse condemnation. California is one of two states (Alabama is the other) that uses this clause to hold public entities like PCG responsible when something goes wrong. For a better understanding of this, I highly recommend an article by WYCO Researcher entitled PG&E Bankruptcy: Impact On Investors. As long as California continues to interpret inverse condemnation the way they do I will avoid any investing in any more utilities that have significant operations in that state. Currently, John still holds shares of Southern California Edison (SCE.PD) and will continue to hold them for the foreseeable future. Based on the current forecast/model, I believe that John will be averaging just under $1,640/month from these two retirement accounts for an annual dividend income of $19,674.00. In John's Traditional and Roth IRAs, he is currently long the following mentioned in this article: Apple REIT (APLE), Artis Real Estate Trust (OTCPK:ARESF), Boeing (BA), BB&T (BBT), Bank of America Preferred Series L (BML.PL), BP (BP), Brixmor Property Group (BRX), Canadian Utilities (OTCPK:CDUAF), Chatham Lodging Trust (CLDT), CVS Health Corporation (CVS), Chevron (CVX), CyrusOne (CONE), Dominion Energy (D), Digital Realty Preferred Series J (DLR.PJ), Duke Energy (DUK), Eaton Vance Floating-Rate Advantage Fund A (EAFAX), EPR Properties (EPR), EPR Properties Preferred Series G (EPR.PG), Federal Realty Trust Preferred Series C (FRT.PC), General Dynamics (GD), Healthcare Trust of America (HTA), Iron Mountain (IRM), JPMorgan Chase (JPM), Kimco Preferred Series L (KIM.PL), Kinder Morgan (KMI), Coca-Cola (KO), Kite Realty Group (KRG), LTC Properties (LTC), Lexington Realty Trust (LXP), Main Street Capital (MAIN), Altria (MO), Realty Income (O), Owens & Minor (OMI), Occidental Petroleum Corp. (OXY), Bank OZK (OZK), PacWest Bancorp (PACW), Pacific Gas & Electric Preferred Series D (PCG.PD), Pattern Energy (PEGI), PepsiCo (PEP), Park Hotels & Resorts (PK), PIMCO Income Fund Class A (PONAX), Regions Financial (RF), Royal Dutch Shell Class A (RDS.A), South California Edison Preferred Series D (SCE.PD), STAG Realty (STAG), AT&T (T), Toronto-Dominion Bank (TD), T. Rowe Price (TROW), Valero (VLO), Valley National Bancorp (VLY), Umpqua Bank (UMPQ), Ventas (VTR), Walgreens (WBA), Welltower (WELL), Westrock (WRK), and W.P. Carey (WPC). Disclosure: I am/we are long T, MAIN, OZK, PACW, UMPQ, VLO. I wrote this article myself, and it expresses my own opinions. I am not receiving compensation for it (other than from Seeking Alpha). I have no business relationship with any company whose stock is mentioned in this article.